HI; I've been watching some of the youtube videos on cridgit's page for version 1.4 of Pose Master. If I buy it, I'd be buying the latest version, which I think is 1.5. Well, the first video is how to make a default file. Now, if I bought Pose Master and also the People's Pak, would I have to make those default files? Would I have to edit text files like that? Sorry for the delayed response - been travelling this past week. You are right that the latest version is 1.5. It works much the same way as version 1.4 with a few enhancements. The biggest visible change is that instead of a drop-down list of files, you can now choose files using the standard Win/Mac file chooser. This allows you to organize your files the way you want. I'm not sure which video you're referring to for the default file, but I assume it's the "Creating an Offset Pose" video in which text file editing is required. You DON'T need to do this for normal day-to-day usage of PoseMaster (copy/paste poses and transfer poses between figures). But you will need to edit text files when you're creating data files for transferring poses between figures not already supported. The PoseMaster People Pack provides the data files for transferring poses between all DAZ figures, so it saves you the hassle of creating the data files and editing the text files. Hi, cridgit: After watching more videos, I bought the PoseMaster item. All tests quickly passed. I transferred an M4 pose to Genesis using Copy, then Transfer. Did another. Worked so well, I went back and bought the People Pack. I transferred a David 3 pose to Genesis. Worked well. I looked for poses that involved hand positions, hands or fingers touching the face, hands touching each other, to see how well PM could do the job. Very well indeed! I'm delighted. Just want to thank you for this great product. I don't know all the ins and outs of it yet, but I am going to read the .pdf, and maybe watch more video tutorials. But, I am delighted at how well it works. Thanks for all of your brilliant work. Hi, cridgit: The individual poses all seem to transfer well. So far, I've used V4, M4, D3, and M3. In each case, I transferred poses from the earlier figures to Genesis. Then, I tried Batch Transfer. I'm following the directions in the .pdf. I load what I want to be my source and target figures into an empty scene. I select my target figure (Genesis). I launch PoseMaster Batch. The only thing that shows up is a dialog box that asks me to load the source and target figure and select the target figure. I click OK and the dialog box goes away. There are NO buttons to help me select a source pose or a target pose folder. Now, I'm on a Macintosh, running OS X 10.8.2. The version of DAZStudio I'm running is the 64-bit 4.5.1.6 DS Pro. I just bought and downloaded PoseMaster and its People Pack today, Tuesday, December 4th, so it's the latest version of that. This is probably a bug that has to do with the Macintosh version, I'm thinking. Apologies for the delay responding, as I've been travelling again. You'll need to load BOTH source and target figures into the scene then select the target figure. See attached screenshot with David and Genesis. 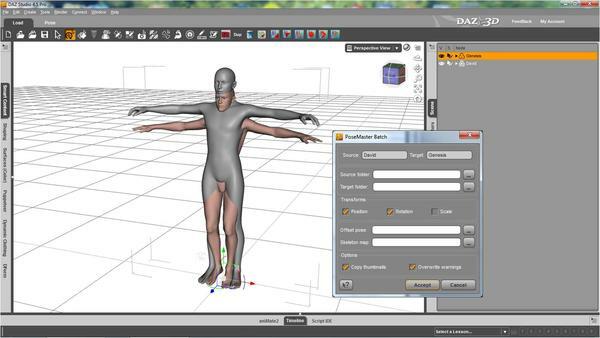 Make sure you select the whole figure by double-clicking it in the viewport, or selecting it in the scene tab. If you select a body part, PoseMaster won't recognize it as a figure. Note in the screenshot that the Genesis root figure is highlighted in the Scene tab. If you do it that way, it should work, otherwise there is something else going on. If you can't get it to work, please post a screenshot so I can see what is going on. Hi, cridgit: It think this is what I have been doing. But, I will try again. Maybe I goofed up somehow. I'll send a screen shot if things don't work. Going to start work on this now. Hi, cridgit: OK, it worked! So, maybe I did something foolish before, eh? That, or, sometimes it seems to me that DS gets a little "confused" if I've been doing various things with it. Maybe it just needed a fresh start. In any case, PoseMaster deserves a great deal of credit. It's a marvelous tool. The set is Jack Tomalin's Curator Aquarum, and the ivy's included -- yeah, it's a pretty nice product. My latest PCI entry also got an honorable mention -- the goth girl's using one of the Moonshines Diner Exterior Poses converted to Genesis by PoseMaster, as were the poses of both drivers from the included M4 poses with Bus Pegasus and Limousine Prince. DS4.5Pro render, postwork in GIMP. Larger version in my deviantART gallery here. Question: I've started trying to use PoseMaster, after having it for awhile now. I'm trying to transfer V4/M4 poses to Genesis. I followed the tutorials, and everything seems to work fairly well. However, most poses have some errors, especially with the feet, which almost always seem to be pointed up. I've tried using things like the reset hands / feet script available here, but that doesn't seem to address the issue. It won't (due to the different 'internals' between Gen4 and Genesis) always give a 100% exact match - but it will get you 95-99% of the way there, with just a few tweaks needed normally, as you have noticed, at the ankle/feet/wrist/hand areas. Considering that just about every Pose I have purchased also needs tweaking on the figure they were created for>/i> I do not find this to be an issue. :) I try and avoid un-tweaked figures as much as I can, hence the usual need to do some tidying up - but even on the base figure I often find that the feet are a) not level or b) set to wear high-heels (for Vicky, at least ;)). Add in using figues on uneven ground ... and you get more than used to quick dial-tweaking to get things 'just so'. Simon is correct in that it won't be 100% in many cases (depending on the pose itself and the source/target figure), but it certainly shouldn't be something noticable the way you're suggesting. My guess is there could be something in your workflow we might be able to improve to get better results. The hand/foot fix is an easy way of fixing gen 4 poses applied to Genesis, but isn't necessary if you're using PoseMaster. Could you please post a screenshot of the paste/transfer options you're using as well as result of the transfer? That would help me identify where the problem lies. It would also help to know which pose set you're using - I can try that out to show you what it should look like. Thanks for the information. I'm fine with needing to adjust a pose - that is a given, especially when you take into account character morphs. It just seemed strange that the feet were always so off. I'll post some examples ASAP. Thanks! I think PoseMaster is an essential product. Is it possible to make different pose-converting for different Genesis shapes (M5 / V5 / Freak5 / Child / etc.) or is it only possible to make converting for General Genesis? It is possible, but given the effort required to make such fine-grained adjustments vs. the increased accuracy of the transfer, I'm not sure is a worthwhile balance. The Genesis characters share a common skeleton, although their proportions and rigging are different. PoseMaster works based on mapping bone names between different skeletons, and it adjusts for figure differences by applying offsets (translation/rotation/scale). This approach fundamentally limits how much you can compensate for proportion or rigging differences. For example, some poses for figure A might cause ankles to intersect or a hand to intersect the hip. PoseMaster reduced these problems, but some poses might still need manual tweaking. I believe you'd be better off tweaking the transferred pose than to spend more time trying to perfect the pose transfer data files (because I'm not sure they'll deliver better results). Hope that clarifies and thank you for supporting the product. Is it advisable to convert with "scale"? What is the advantage to convert with "scale"? Most of the Poses works perfect with the different Genesis Shapes. Incidentally: I think your tool is very cheaply - considering that two or three single pose-packs cost the same as your complete tool (incl. "People Pack")! You can ignore scale for most cases, as the pose itself is determined by the joint rotations. The only time scale matters is when you want to try and get a near-perfect pose match, e.g. hand on hip or folded arms etc. But for most cases you just need rotation. Have both PoseMaster for DS and People for PoseMaster and i find this sooooo useful to converte oldies gens poses to Genesis. I was about to use it again to convert some baby and mother poses (MB3 and V4) but i couldnt find any reference to the babies in the list... will there be an upgrade to the product so babies'll get in ?? Unfortunately I don't have Mil Baby and I haven't been able to find it in the store, otherwise I'd be happy to take a look at a set of transfer files. The tutorial shows how to create your own transfer files (you need to create an offet pose and a skeleton map) and I'd be happy to walk you through the process if you're willing to invest the time. It'll probably take an hour or so is my guess. Otherwise if you prefer to wait, I'll see if I can get hold the baby. Just wanted to check in and see if you're still planning to release an animal pack at some point. I love your PoseMaster and was looking forward to sharing my animal poses and animations amongst each other. You're right, seems the millenium baby has vanished from the store, got it in the early days of last november and havent used it much so far. I wanted to adapt the free CV-Mother_Child_Poses available @ShareCG to Genesis to get rid of old gens i don't use. Will try to create my own transfer files and welcome any help. Will try once home tonight and i'll let you know if i'm stuck or ok with the process i've never tried so far. BTW have a question, would my result be exportable so it could be used as freebee to any other interrested in ? I'm still planning on it, but to be practical (and honest), I haven't really found the time yet. Between a new job and helping with with my wife's business, everything's gone a bit haywire. It'll probably take me a couple of weeks to do it justice, and I don't see that happening until I get some vacation time. Unfortunately I'm not one of the PA's who can claim this as their day job, so I need to fit it in when I have time. Step one is to create a skeleton map, so if you could load up the Mil Baby and post a screenshot of the scene hierarchy with the whole skeleton expanded, I could point you to a skeleton map that would work (assuming you already have the People Pack). That'd be half the work done already! It looks like Mil Baby 3 has the same skeleton as the other gen 3 figures, so you can use M3's transfer files to create a Mil Baby transfer file. 1. Load Mil Baby into the scene and select PoseMaster Copy. 2. Open My Library/Scripts/cridgit/PoseMaster/data/Default.PSR in a text editor. 3. Copy the figure name on line 2. The example below is from V4 and you need to copy the blMilWom_v4b_68498 part. 4. Copy My Library/Scripts/cridgit/PoseMaster/data/Genesis from M3.SKL and rename to Genesis from MilBaby3.SKL (or whatever you like). 5. Open My Library/Scripts/cridgit/PoseMaster/data/Genesis from MilBaby3.SKL in a text editor. 6. Replace blMilMan_m3_72712 on line 2 with the Mil Baby figure name from step 3. 7. 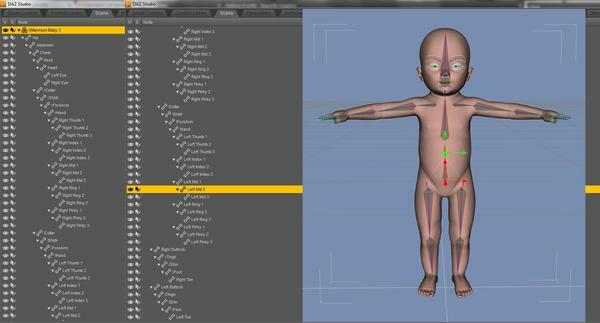 You've now created a skeleton map to transfer Mil Baby poses to Genesis, accounting for skeleton differences. 8. If you want to create a skeleton map to transfer Genesis poses to Mil Baby, follow steps 4-6 using My Library/Scripts/cridgit/PoseMaster/data/M3 from Genesis.SKL and again replace blMilMan_m3_72712 with the Mil Baby figure name. 9. Test your skeleton map by using PoseMaster Transfer from Mil Baby to Genesis without a skeleton map, and with a skeleton map, for a variety of different poses. Next step is to create offset files to adjust poses TO Genesis FROM Mil Baby. This is explained step by step in the User Guide (page 43 onwards). The example shows how to do create an offset TO MilDog FROM MilHorse - don't get the source and target figures mixed up! I suggest you follow those instructions step by step and if you get stuck please let me know. Thanks for these instructions, i'll try them tonight after workday. BTW, the MB3 looks taller than the Genesis Baby do you think that could cause any troubles later ? Below are several picts showing 3 GenBabies vs 1 MilBaby3 (wich also make an idea of the height difference). Glad to see you got it working. The problem with the fingers in the mouth is that for some poses you won't get 100% perfect transfer. The skeleton map and offset pose adjust for figure differences, but cannot fully eliminate those differences. You will see this especially when hands need to be positioned precisely e.g. on a hip, touching an eye or finger in the mouth. These poses require minor adjustments by hand to get the 100% result. Of course you could tweak your offset pose to transfer the finger in the mouth pose better, but that will take a lot more time and then a different pose might not transfer as well. I usually create the offset pose then test them on lots and lots of poses, making minor adjustments every time until I feel the offset pose is as good as possible to match a wide variety of poses. Great job, and hope you will have lots of fun with your baby poses!